I can't believe it's October already. I recently came across the sample of Atelier Cologne's Jasmin Angélique that a friend passed to me over lunch one day back in July. That visit is still very fresh in my memory, and at the same time it seems much too long ago. That's how things are with long-distance friends. Now Jasmin Angélique is inextricably bound in my imagination to that happy afternoon; fortunately, it lives up to that challenge for me. Jasmin Angélique is the latest addition to Atelier's Cologne Absolue collection, and it's described as "a mysterious path to a secret garden," with notes of lemon, Sichuan pepper, angelica, jasmine, galbanum, fig, incense, white amber and tonka bean. Like all the Cologne Absolue scents, it includes a high-quality citrus accord. This one is an irresistibly tart opening that reminds me more of lime than lemon, perhaps thanks to the tang of the accompanying pepper. The angelica note doesn't have the intriguing bitterness of Frederic Malle Angéliques sous la Pluie; it's a brighter, cleaner take on the subject. The mingling of the tart lemon (lime?) and the angelica reminds me of a gin-and-tonic. I don't wear any jasmine soliflores, or many big white florals in general; they're just not as "me" as roses, violets and carnations are. Yet I really enjoy Atelier Cologne's interpretation of jasmine here — it's one part of a balanced composition that also includes the above-mentioned citrus cocktail, a fruity-green fig and a hint of something mango-like. The base of almond-y tonka and sharp, faintly "dirty" musk clings nicely and makes this scent more gender-neutral than the name might suggest. My sample vial of Jasmin Angélique is a bit leaky, and it perfumed the inside of my purse with a stray drop or two today. The lingering scent made me smile every time I reached for my wallet or my lipstick. I'm considering purchasing a small bottle of this fragrance (or perhaps some of the matching shower gel, or the candle) for autumn and winter days when I miss my faraway friends or just need a dose of summery cheer. 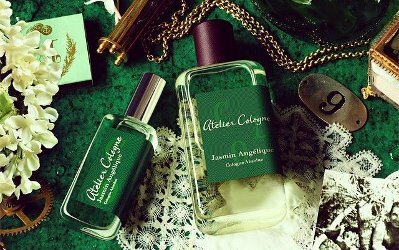 Atelier Cologne Jasmin Angélique was developed by perfumer Jérôme Epinette, and is available in 30 ($85), 100 ($145) and 200 ($210) ml. For purchasing information, see the listing for Atelier Cologne under Perfume Houses. This fragrance is an oddball for me. I imagine it would be polarizing – complete love or hate. I got a 10mL split of it, and used it several times. Every time I could only smell the jarring angelica note and just about nothing else. I kept wishing there was much more jasmine because I couldn’t detect any. I have the feeling this is highly impacted by body chemistry. I know all perfumes smell differently on each individual but this one strikes me as smelling vastly different. I sprayed it on my friend, and it smelled much more figgy and fruity (+ angelica) on him, but still no jasmine. I was surprised that I liked it — the list of notes didn’t appeal to me at all. Maybe I like it *because* the jasmine is so subtle? Your description makes this sound so appealing! Hah! Well, I feel the same way about oud, so…I can’t judge. I so much feel that way about oud, I’m somewhat surprised you can’t tell which it is even without spraying!! Usually I can smell it from a mile away. But in any case, will be curious to hear what you think, once you’ve found a well-ventilated area in which to test them The Jasmine Angelique is def a very far cry from anything with oud! It sounds like the jasmine is nicely grounded in this. I often find white florals to be on a frequency that is too high for me! Yeah, this is definitely not a BWF-style jasmine. Nope, not at all! The name is a little misleading. I hope you’ll have a chance to try it, Nebbe! As ever, I feel like I am constantly learning so much–thank you Jessica, I had really been stumped by how to say what exactly this smelled like (other than “pretty good!” or “very charming!”), but I think “fruity-green fig” is right on the money! Def agree with bright, too. Wouldn’t have minded if the fragrance had been a TAD dirtier but still agree, it’s not one that screams “feminine” (especially as stacked up against the name.) Thank you so much for your very precise account, so illuminating! Sometimes I get a little more dirt in the base…sometimes, less. It’s interesting. I really like about 80% of Atelier’s line and this one is firmly in the like very much category for me. It is definitely a different take on Jasmine and can be very comfortably worn by those who are not big floral people. Bright, intriguing and in the end a touch comforting as well as appropriate for lots of situations. Take it for a couple of spins before writing it off, it is definitely not your usual and sometimes our sniffers take time to adapt to something out of the ordinary. The same here — I have a few favorites in this line. They’re very consistent. And I didn’t have much interest in this one when I originally sniffed the vial, so I’m glad I went back to it later! “Something mango-like” definitely makes me want to try Jasmin Angelique. I love jasmine flowers but have trouble with straight-up jasmine fragrances. Either they screech at me, or I can’t smell much at all. I like jasmine scents when they have a bit of something yellow or orange in them leaning toward tropical fruit or flowers.